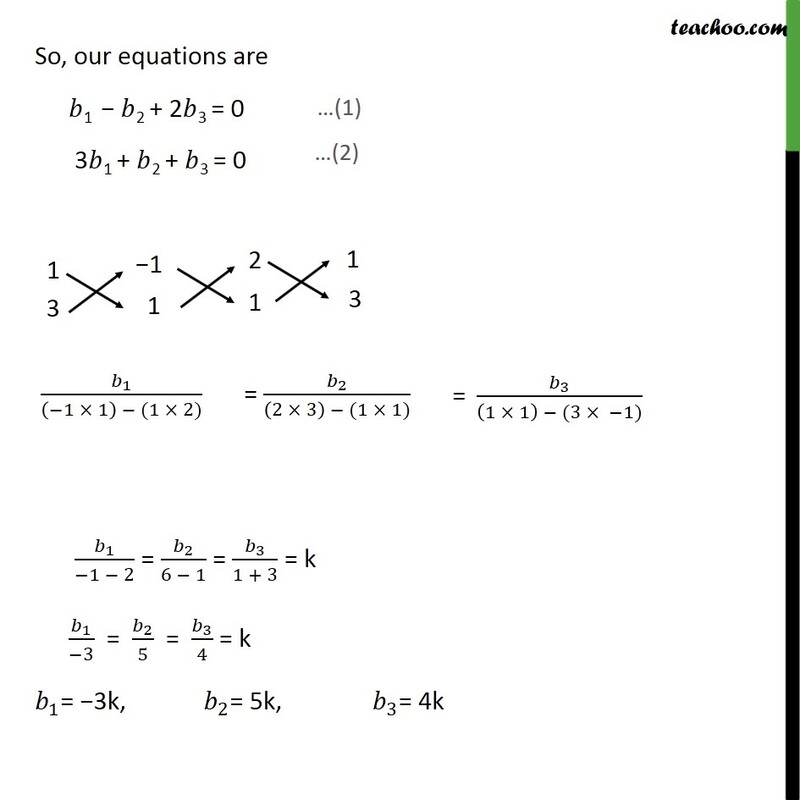 Misc 19 (Method 1) Find the vector equation of the line passing through (1, 2, 3) and parallel to the planes . ( + 2 ) = 5 and . (3 + + ) = 6 . The vector equation of a line passing through a point with position vector and parallel to a vector is = + Given, the line passes through (1, 2, 3) So, = 1 + 2 + 3 Given, line is parallel to both planes Line is perpendicular to normal of both planes. i.e. is perpendicular to normal of both planes. 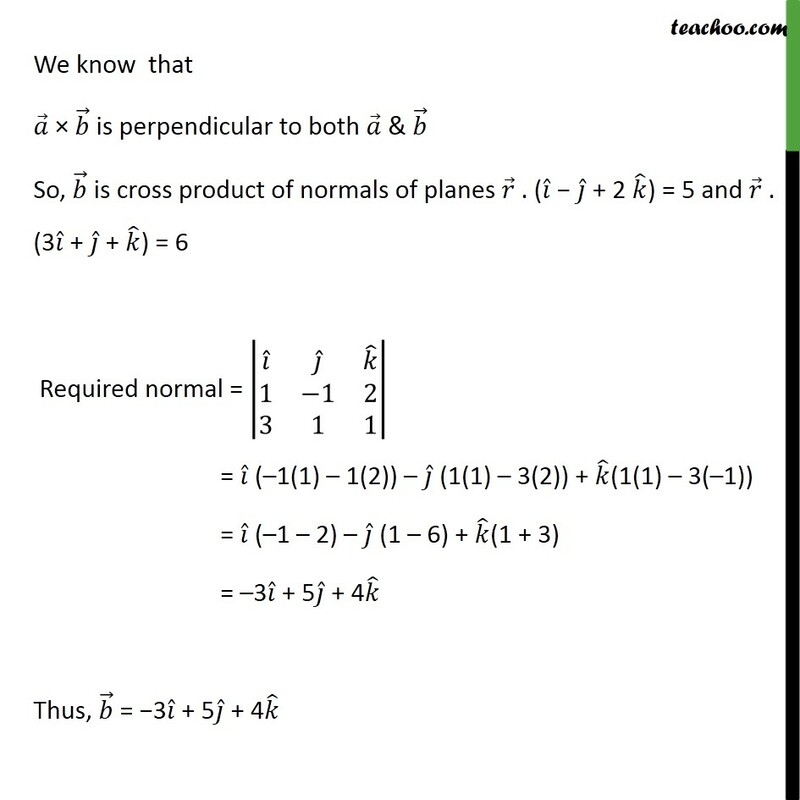 We know that is perpendicular to both & So, is cross product of normals of planes . ( + 2 ) = 5 and . (3 + + ) = 6 Required normal = 1 1 2 3 1 1 = ( 1(1) 1(2)) (1(1) 3(2)) + (1(1) 3( 1)) = ( 1 2) (1 6) + (1 + 3) = 3 + 5 + 4 Thus, = 3 + 5 + 4 Now, Putting value of & in formula = + = ( + 2 + 3 ) + ( 3 + 5 + 4 ) Therefore, the equation of the line is ( + 2 + 3 ) + ( 3 + 5 + 4 ). 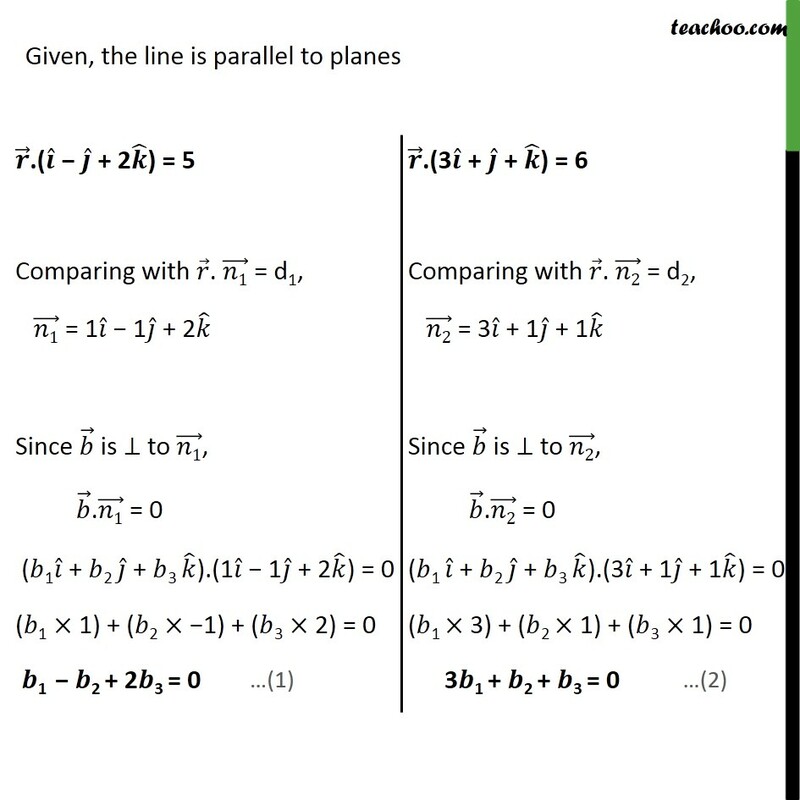 Misc 19 (Method 2) Find the vector equation of the line passing through (1, 2, 3) and parallel to the planes . ( + 2 ) = 5 and . (3 + + ) = 6 . 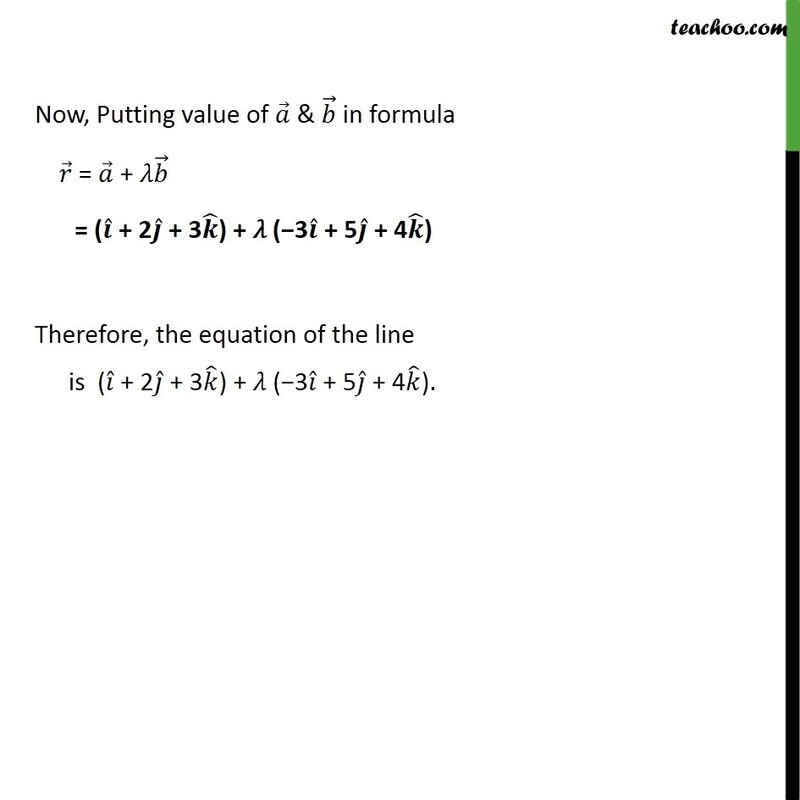 The vector equation of a line passing through a point with position vector and parallel to a vector is = + Given, the line passes through (1, 2, 3) So, = 1 + 2 + 3 Let = 1 + 2 + 3 A line parallel to a plane is perpendicular to the normal of the plane. 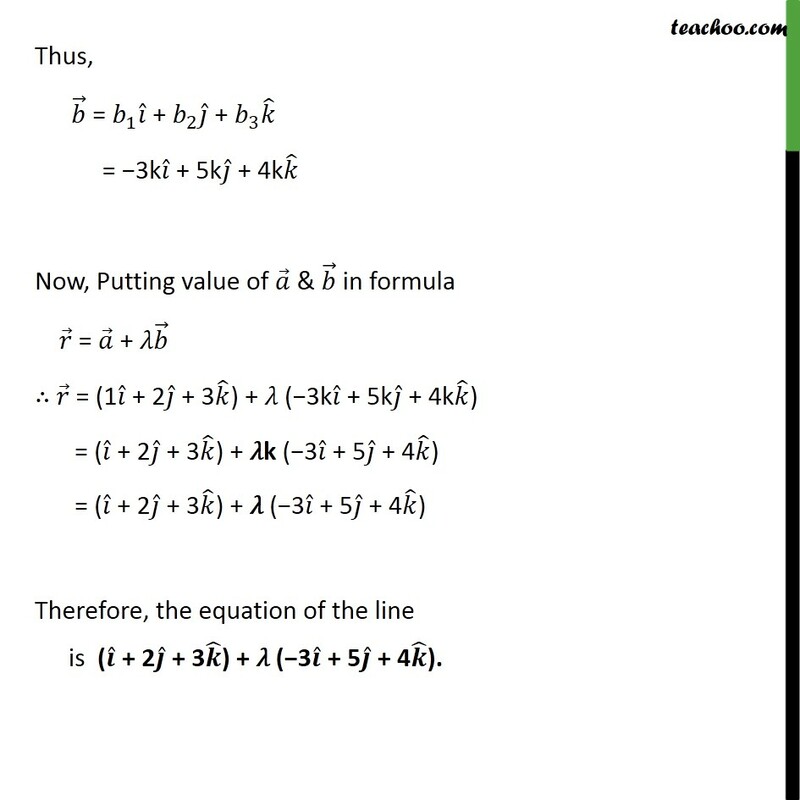 And two lines and are perpendicular if . = 0 Given, the line is parallel to planes So, our equations are 1 2 + 2 3 = 0 3 1 + 2 + 3 = 0 Thus, = 1 + 2 + 3 = 3k + 5k + 4k Now, Putting value of & in formula = + = (1 + 2 + 3 ) + ( 3k + 5k + 4k ) = ( + 2 + 3 ) + k ( 3 + 5 + 4 ) = ( + 2 + 3 ) + ( 3 + 5 + 4 ) Therefore, the equation of the line is ( + 2 + 3 ) + ( 3 + 5 + 4 ).